Do you remember when social media felt like a magical place to spend time? It at once felt like the biggest and most intimate conversations could all happen in one place. And then the marketers came. This, people, this is why we can’t have nice things. Don’t get me wrong, I’m a business owner, I’m not blaming the marketers for the state of social media today. We all contributed to the noise that is our current social media world. Instead of using it as a way to connect, we started using it as a “look at me” magnifier where we had to get louder and louder to be heard. And we got tired. We got tired of the noise, we got tired of competing for attention, we got tired of wondering why social was “working” for everyone else and not for us. We forgot, that actually, we are in charge of how we use social media and if we want it to be a valuable place to spend time then it is up to us to take back control. It’s not going to be easy, social media is designed to capture and hold your attention but I believe that by making small adjustments to our approach in using social media, by breaking the bad habits we’ve built up and by making smart use of the tools and systems which are available to us we can really make social somewhere we enjoy spending time again. Where we can connect with people who we may never have had the opportunity to connect with any other way and create valuable interactions. And don’t tell me that you need to be on it for your business, you don’t. If you were born before 1997 then social media didn’t even exist in your world. MySpace didn’t start until 2003 with Facebook launching a year later in 2004. While social media may seem all consuming these days it’s not been around that long. People grew and ran successful businesses way before social media and they will continue to do so after we have evolved onto whatever is coming next. Social media can be useful for your business but don’t try to tell yourself it is necessary. It stops you looking for opportunities in other places if you do that. For me, social media is an important way to stay connected. I have a busy life, I’m an expat living away from most of my family. Social media is a great way to stay in touch with the day to day of people’s lives. It is a fantastic way to interact with other business owners, not so I can sell to them but so we can make actual connections which are benefit to both of us. Take Action: Make social, social again. Stay away from the like button. Leave a comment so that people know that you actually took the time to engage with them. Have a conversation, even better, make time to have a real-life conversation with them. Aaargh! Marketing jargon! A buzzword! Wait… Do you remember what being authentic meant before the online marketing world took the word over? The dictionary says “Genuine, based on fact. Accurate or reliable” Hmm, that doesn’t sound like a lot of social media I see these days. I like Seth Godin’s definition better when we are talking about being authentic in our businesses. He defines it as: "consistent emotional labor." Take Action: Show up consistently as yourself. Consistent doesn’t mean keeping to a strict schedule. Only do that if it helps you stay on track. It means making sure that every time you post something on social media do it as you, not as the version of you that you think other people want to see. Steph Panther of My Mindset Coach had a great recommendation on her Instagram to unfollow anyone that makes you feel like you need to be someone else. If you feel bad or not good enough when you see posts from someone else in particular, unfollow them. For me that means that I hide any sponsored content that tells me that I need to diet, or be a certain body shape or that makes me feel less than in my business or personal life. Does that mean you should unfollow people you who are ahead of the curve from where you are now? I believe in models of possibility, so if someone is a model of possibility to you then that's great but if you constantly feel less than when you see their posts appear on social media then set them free from your feed. If you find seeing Oprah’s post inspirational, keep following her. If every time a post from Oprah appearing in your feed it is just a crushing reminder that you are not yet Oprah, unfollow her. I promise she won’t mind. I've also unfollowed anyone who is using Instagram to sell to me. If the feed is curated, only uses stock photos, puts a quote in every third image etc then unless they are a client I won't follow them. I'd rather spend my time there making authentic connections (see point #1 to remind yourself what is authentic). Take Action: Unfollow everyone and everything that doesn’t feel good when you see it. You are not a captive audience, you have the power to control what you see. Fear of Missing Out, FOMO, it’s real. There’s no point denying it. But if you really think about the things that you have consumed recently on social media, how much of it was truly essential? How much of it helped you get closer to where you want to be in that moment? How much of it would you truly have missed if you hadn’t seen it? Take Action: Ask yourself, "Does (doing/consuming/sharing) this move me closer to or further away from my goal?" Then worry less about what you might be missing out on if you spend your time elsewhere. Get your phone out of the bedroom. This is a big one for me. I’ve gone through periods when I don’t have my phone in the bedroom and I've gone to sleep earlier, I’ve slept better, most importantly I’ve missed out on absolutely nothing. But somehow, over time the phone crept back into the bedroom and the bad habit of looking at social media before I go to sleep and when I wake up was back. We all know that our phones are not the first thing we should look at in the morning or the last thing we should look at, at night. Yet many of us do. Take Action: Time to ban the phone from the bedroom (again). And while we’re at it, no tablets or laptops or tv’s either. Make your bedroom a place you sleep. Turn off sound and banner notifications for everything but the essentials on your phone and tablet. I did this about 5 years ago, maybe more and the only things that have a sound notification are texts, WhatsaApps, an app which tracks the flights of loved ones arriving at Schiphol and the rain alarm app (essential in Amsterdam, otherwise you’re going to get wet, a lot). I don't have any visual notifications telling me how many unread emails I have. I also don't have unread emails very often, I inbox zero as often as I can. I don’t have any social media notifications turned on, I don't need to know when people post or comment, I'll find out when I open the app. These apps are designed to get our attention and if our attention shifts away from them, they are designed to get it back. Don’t be a slave to notifications. You choose when you want to check things, when you have time to do so. Take Action: Turn off all notifications on your phone/tablet/laptop. Get into the habit of setting aside dedicated time for social media so that you are in control of the time that you spend there. Which sounds drastic, but doesn’t have to be. You could try something radical like deleting your accounts and opening new ones. But it’s much easier to use tools which clean things up for you. It’s like starting from scratch but not quite. Take Action: Use the Chrome extension Nudge to unfollow everything on your Facebook account in two clicks (note: it doesn't unsubscribe you from anything but it automatically turns off all notifications for *everything* including friends, groups, pages). It sounds scarier than it is but by zeroing all your notifications you can then go back in and switch on the notifications of people you really want to hear from. It's made Facebook a much nicer place for me to spend time these days. For most of us it is the newsfeed that is the problem. So much stuff to scroll through before we see something we want to engage with. Facebook has promised to do their best to change this but until then, turning off your newsfeed on your desktop might be a good solution. Take Action: I have had NewsFeed Eradicator installed for around 2 years now. If I want to read my newsfeed I open the Facebook app on my phone, which means that any time I spend in the app is intentionally set aside for scrolling my newsfeed. Now that I only have things I want to see in there (thanks to Nudge) I don't worry too much because there isn't much to scroll through. It takes no time at all. Most people have forgotten about lists but you can use Facebook or Twitter Lists to organise who you want to see updates from so you only see what you want to see from people and causes you care about. Take Action: Make a list of the type of people you are connected with, this could be friend, family, colleagues. Create a list for each category and then sort people into the relevant category. That way, when you want to see updates from your friends you can just check the list instead of relying on the algorithm to show you their updates. Go old school and add the news/blogs etc. that you want updates from to an RSS feed reader like Feedly. Or use something that makes reading a more pleasurable, visual experience such as Flipboard. Then you can safely unlike all of those pages on Facebook and updates on Twitter. Social Media isn't a news service (although it likes to pretend to be sometimes). You need to control your own media consumption with publications you trust and enjoy. Take Action: Install an RSS reader or Flipboard and add your favourite publications to it. Make a date to regularly review what you are reading and unsubscribe from anything that doesn’t make you want to pay attention on a regular basis. If you have an iPhone, remember that Safari has built-in settings you can use to block websites. If you are the sum of the people you spend the most time with then you are definitely the sum of the media you consume. Stop with the trashy reading and make your reading more intentional. Take Action: Install blockers on your phone to help you use your time on social media more wisely. Try apps such as Rescue Time or Freedom to help you. If you have a habit of checking news sites all the time, just in case something has happened in the world. Lose the habit by subscribing to daily update briefings. I have one from the Guardian (for the European perspective) and one from Vox (for the US perspective) that keep me mostly on track. News media is terrible for social media because they have to pound dozens of updates in every day onto your feed to get your attention. The algorithm will learn what you click on and then only serve up similar content, meaning you miss the important stories anyway. Take Action: Make a list of the publications you want to hear from. Check their website for a daily digest and subscribe if they have one, then unsubscribe from them on social media. Try services such as The Weekly (UK based news) The Daily Skimm (US based news) Popbitch (UK gossip and culture) Politico ( US and EU based political updates) The Pool (UK based female lifestyle). What about you? 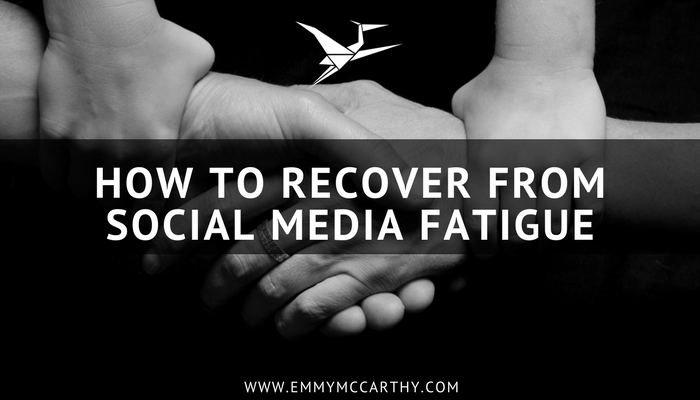 How will you recover from social media fatigue and make it somewhere you want to spend time again? I truly believe that the best way forward is to make it a place where humans connect with humans. I'll let you know how it goes. If you want more systems and strategies to work smarter, not harder, then you'll love my Notes for the Curious. It's published every two-weeks and delivered straight to your inbox. Notes for the Curious is a curated digest of everything I am learning and loving about running a business and living a life on purpose. From time management to goal setting, community building to confidence boosting as well as systems and tools to make your life easier, we will cover it all.